I suppose there’s a part of an endurance athlete that has to forget. Forget the pain, the toughest moments, those parts of the race that make you ask why you do this thing. Because, if you only remember those moments, no matter how fleeting they are, you’d stop doing this right now, and never do it again. We’re conditioned to remember everything else – pace, breathing, distance, what it feels like at mile 10, at mile 15, at 20, where our thoughts are, all of it. And thank God we do. Because its those things that get us through each race, each test. Most of you who know me and keep up with me know that this race was not the race I had planned on running. My original marathon this spring was supposed to be at Myrtle Beach on February 16. Without going into too much detail ( I will over a beer if you want sometime), that race was cancelled and I had to scramble to find a spring race. 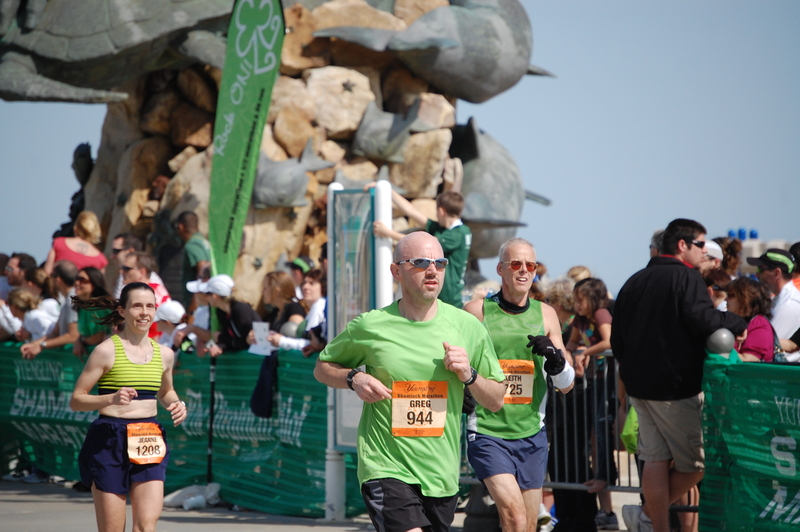 Cue the Shamrock marathon. 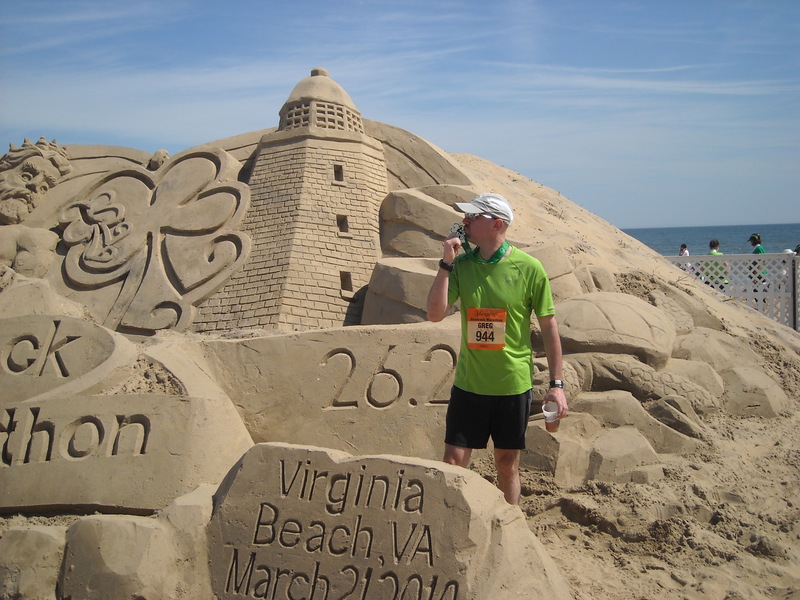 It seemed like a good fit because (a) I had run it before, (b) It was a beach marathon, with a similar flat course to Myrtle Beach and (3) it was only 4 weeks later. I’d like to add an asterisk to that last one, because at the time, 4 weeks didn’t seem like such a big deal. So this marathon was my Do Over. I don’t consider myself a marathon veteran per se, as I’ve only now done two, so adding another month of training to my already 16 weeks immediately became incredibly daunting. I wasn’t sure what to do, so I just repeated the final four weeks of training I’d just done. Sounds simple enough, right? Physically, I don’t think it took too much of a toll on me, but mentally and spiritually I was probably past ready for a race. I mostly chalk that up to the process of getting my mind in the right place for it. I will always think that I was totally ready mentally for the Myrtle Beach race, so it was tough for me to get my thoughts together for VA Beach. But I digress..
Virginia Beach was much different from last year in more than one way. 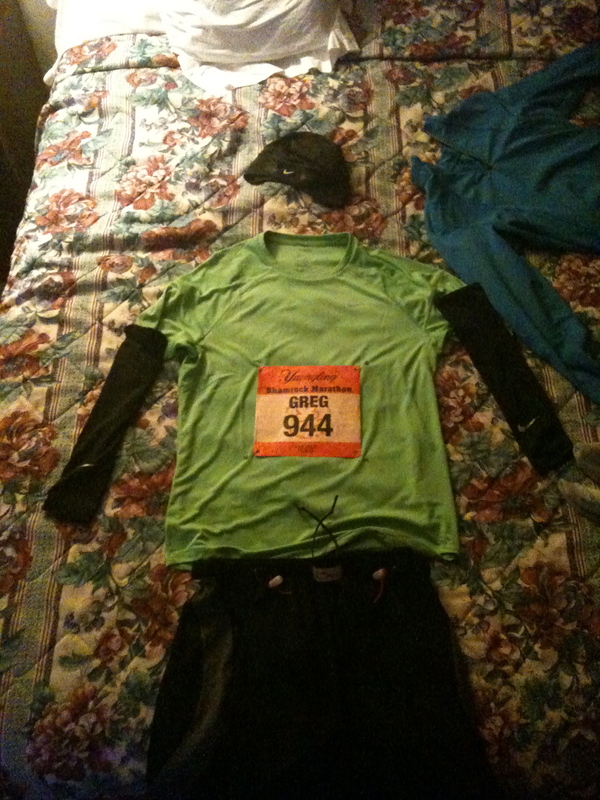 09 was a cool day – with lows at race start in the upper 30s and temps when I finished in the upper 50s. Yesterday it was 54 when I woke up and around 73 when I finished. Given the choice, I’d take the cooler day. 54 is great to start, but 71 after 20+ miles is hot. Secondly, and maybe because of the much warmer weather, the town was abuzz with people this year. Last year, it almost seemed like a sleepy little beach town and for the most part, was populated only by runners and their support. This year, we shared the beach with spring breakers, families and even some bikers. All the more festive I suppose. Up over the bridge on the south loop where we passed the slowest wheelchair racers going up, and they passed us coming back down. Watching the elite athletes come back past us at the first turnaround. Seeing those amazing men and women really motivated me…so much so that I had to remind myself to slow down. The troops at Camp Pendleton in uniform cheering us on. So so cool. It’s like a mini-marine corps cheering section. Swinging back into town near halfway and seeing Cindy – her smile keeping me moving. The halfway point and being dead on for pace. 1:50 exactly. I clearly remember smiling at the clock. The tent at about mile 15 offering beer instead of water and Gatorade. No, I did not take them up. Miles 20-23. This is where things got tough. It was a loop that left the beach. That left me with no breeze, no shade and pretty much no crowd support. At this point, my legs really started to get stiff and tired. And as I continued to run, the stiffness(?) moved up my legs into my back and neck – and eventually my jaw. I was good the entire race from a cardiovascular and breathing standpoint, but tightening up was tough. Very tough. This is the part I had worked to get to and through. This was the part that I don’t want to remember for too long. The last few miles, coming back into the crowd support – including the high school group all dressed as super heros (corny super heros, but heros still) cheering us on. Making the turn onto the boardwalk and seeing King Neptune and the finish line 1/4 of a mile away. I finished the race at 3:44, five full minutes faster than last year. I’m pleased with my finish. As always, Cindy was able to get my attention near the finish even above the screams of the hundreds of others cheering. I live for seeing her at the end of a race. I did try a couple of things differently this year: 1) I doubled my gel intake this year, with 4 total gels over the course and 2) I crushed the water/Gatorade stops. I only skipped one, maybe two the entire race. I think both stratagies helped. All in all, a good time, with what I still consider a great post race party, including Irish stew and all the Yuengling you can drink, under a tent right on the beach with live music. So what’s next? Well, immediately, a few days off. Then – The Tarheel 10-Miler. As for later, I, along with thousands of others, keep checking my inbox for any word on my lottery entry into the NY Marathon. Outside of that, I’m planning on registering for Marine Corps for the fall. Then again, that’s because the tough stuff, the pain – I’m already starting to forget it. -see you on the road.